The Lord's Prayer: This incredibly famous prayer is memorized and recited by millions all around the world. The Lord's Prayer is so well-known and widely quoted, many people think of it as just an old prayer from the past.. 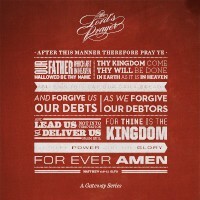 The Lord's Prayer: This incredibly famous prayer is memorized and recited by millions all around the world. It has shown up in countless films, TV shows, books and songs. The Lord's Prayer is so well-known and widely quoted, many people think of it as just an old prayer from the past. But this prayer isn't just a great saying form the past ... it's a powerful truth that should define how we live and pray in the present. In just a few short sentences, Jesus gave us a timeless prayer containing the most important things we need to know and believe.